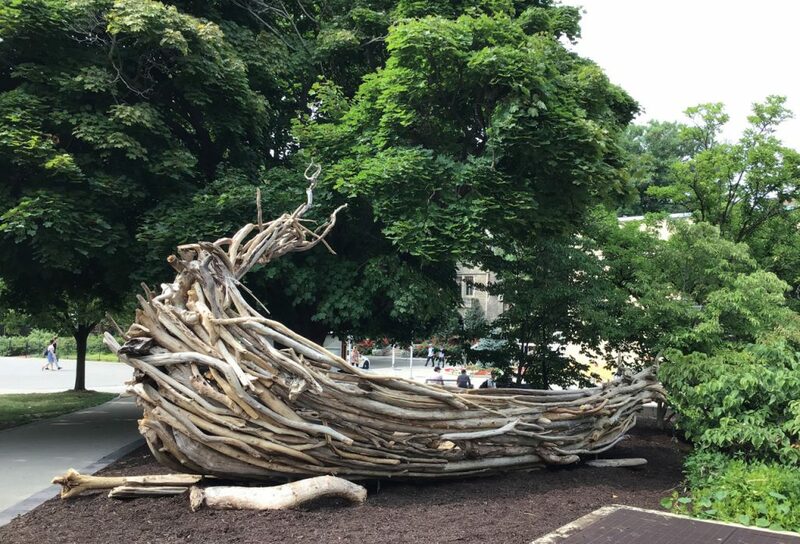 A new site-specific sculpture of a boat-like form was unveiled on campus this weekend in the McMaster Museum of Art’s Artist Garden. The 27-foot vessel was created by mid-career Canadian artist Ernest Daetwyler. It is built from large pieces of scavenged driftwood and titled The Boat Project/everythingwillbefine. The artist describes this work as “a symbol for a time of change and challenges and existential fluctuation that life can present.” He intends it to be a site for active engagement and reflection. To that end, Daetwyler has created an intriguing and inviting space within the boat – one that the community on campus may enter, to meet, relax, sit down for a while and take a short break. A harbour of sorts. Ernest Daetwyler’s multidisciplinary projects, exhibitions and public interventions are presented internationally. His numerous awards include the Canada Council for the Arts, the Ontario Arts Council, Pro Helvetia, Switzerland, the Swiss Federal Office of Culture, Presence Suisse, the OAAG 2010 Exhibition of the Year Award, the Region of Waterloo Arts Fund, the Waterloo Region Arts Award and the Pollock-Krasner Foundation, New York, N.Y. He is based in Atwood, Ontario. The Boat Project/everythingwillbefine will be on view in the Museum’s Artist Garden from 2018 – 2020. It was generously supported by the Ontario Arts Council. The Artist Garden project series was launched in 2014 to revitalize an empty lawn adjacent to the McMaster Museum of Art’s entrance. Previous installations include Simon Frank’s Untilled 2014-2016 and TH&B’s Basin 2016-2018. The latter was purchased by McMaster and is now installed on campus by the Dr. Robert and Andrée Rhéaume Fitzhenry Studios.